Premiere Carte Des Isles de la Sonde. 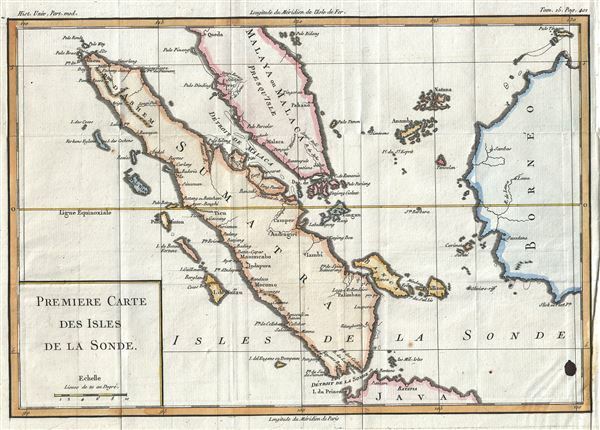 This is a beautiful 1760 map of the island of Sumatra and the southern part of the Malay Peninsula by Jacques-Nicolas Bellin. It covers the entire island of Sumatra, Indonesia, as well as much of modern day Malaysia. Parts of Java and Borneo are also included. The Straits of Malacca (Malaca) and the Straits of Singapore (Sincapura) are finely detailed. The map notes many coastal features, including shoals, banks and small islands. Singapore Island is not specifically named, but it is shown, and several other lesser islands are named including Tioman Island, Banca, and Penang, etc. The cities of Palembang, Jambi, Aceh and Jakarta are located. The map was issued by Bellin as part of Histoire Universelle. Very good. Minor wear along original fold lines. Original platemark visible. Ink stain in lower right quadrant of the map. Blank on verso.